Pebble officially launched their appstore today for iOS users with Android to follow. The store resides within an update to the existing Pebble smartphone app and will be the discovery centre for apps and watchfaces for their user base which is now past 300,000 smartwatch owners. The appstore is a welcome addition for Pebble users to personalize and add further value to their smartwatch. It is also an important step in supporting an already existing developer ecosystem for the wearable device. According to Pebble, more than three million apps and watchfaces have already been downloaded from third party directories some of which already have a catalogue well over 2,200 watchfaces and apps such as MyPebbleFaces.com. Pebble has made it clear that they will still support third party stores by continuing to allow downloads that don’t originate from the official store. But having one consolidated and centralized point of distribution provides both app developers and users the necessary inventory and demand an app ecosystem requires to succeed. Pebble users will no longer need to hunt for new ways to use their smartwatch and developers will only have to go to one place to submit and manage their app. In addition, Pebble has designed their appstore to help developer creations get noticed. The Pebble appstore has six major categories: Notifications, Sports & Fitness, Tools & Utilities, Remotes, Daily, and Games as well as an area for Pebble Faces (aka watchfaces). It also has merchandising and featured areas as well as a limited rating system to let users leave feedback on apps they have downloaded. Publishing an app to the Pebble appstore is free for all Pebble developers. And although all apps need to conform to the Pebble appstore developer agreement, the apps are not pre-validated which means no lengthy app approval process to get them to market. Instead Pebble reserves the right to take them down if they aren’t following the rules. Only apps built with the new Pebble SDK 2.0 are being distributed in the store. And right now the appstore only supports free apps. No premium app capability is a weakness of the current Pebble appstore as it leaves Pebble developers with limited ways to make money from their software. If developers wish to earn a living off their app they will have to submit applications that work with an iOS or Android companion app and charge for the mobile apps in the Apple App Store or Google Play. Or continue to use the many third party directories which do support the sale of standalone Pebble apps. Pebble’s website suggests that paid apps may be on the roadmap as are additional features for the store including developer statistics and other ways for developers to promote their apps in collections. All three of these are imperative features for developers to create a business out of wearable apps, so here’s hoping Pebble can get these updates out fast enough to keep developer interest. The appstore obviously marks a major milestone for Pebble. But it represents the start of a bigger shift for wearable tech as a whole. One where the focus is less on the hardware and more on the developers and apps which use it. Like the smartphone space, wearables require a healthy and thriving developer ecosystem to survive and app stores are a huge part of this. Pebble’s announcement today is expected to be the tipping point. Samsung has already suggested they will be opening up access for more Galaxy Gear apps and Google is rumored to be readying a commercial release of the Glassware “boutique” later this year. Pebble arguably kickstarted the wearable hardware craze back in 2012 with the outstanding success of their crowdfunding campaign. Here’s hoping they can do the same in the wearable app space with the release of their appstore. 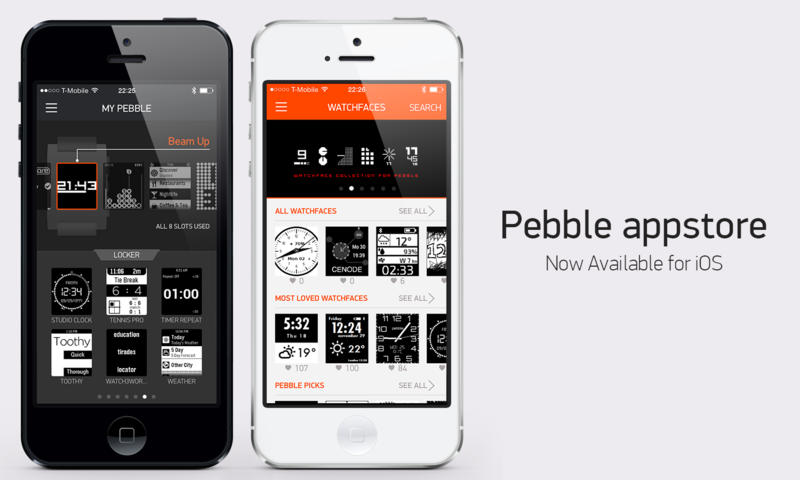 Update: Pebble smartphone app 2.0 is now live in the iTunes app store so download away.